The EU27 have granted the UK an extra two weeks to decide what it wants to do about Brexit. But as far as the EU is concerned, they’re now done discussing the issue. The European Council summit resumed on Friday morning in Brussels with a plethora of subjects on the table: relations with China, industrial policy and climate change among them. The agenda had become so overloaded after the Brexit talks the previous night dragged on so long that all other business was delayed. EU leaders are not happy about it. They are tired of having Brexit hijack these summits, held just four times a year. Frustrations boiled over last night after the British prime minister, Theresa May, was unable, after 90 minutes of questioning, to explain to the other 27 leaders how she could possibly find a way out of the Brexit impasse. 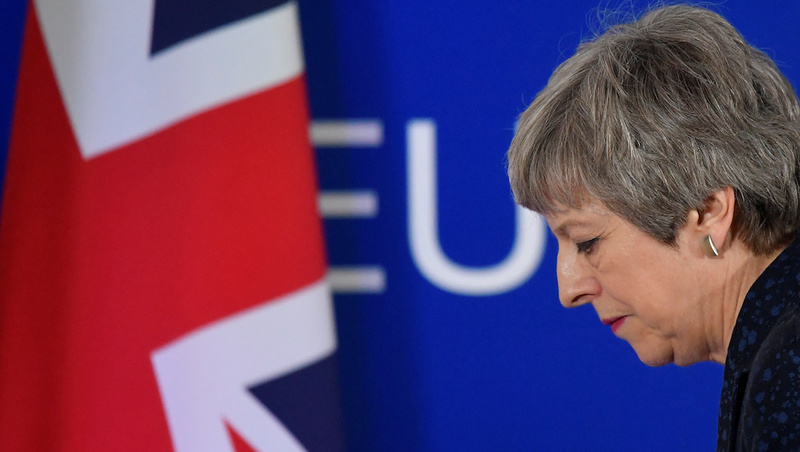 The EU27 had been set to approve a draft text that would have granted the UK an extension until 22 May, on the condition that the British Parliament approves Theresa May’s withdrawal deal next week. By the time May left the room, there wasn’t a single leader who had any confidence that she could get her deal passed, according to EU sources. Desperate to avoid a last-minute emergency summit in Brussels next week, they had to move to Plan B. After hours of talks that dragged on to midnight, they decided to grant the UK an unconditional extension to April 12—the date by which the UK would have to start preparing for EU elections in May. Should the UK Parliament approve the withdrawal deal next week, the UK can get a further extension to May 22 (the day before the EU elections) to complete the legislation. If Parliament cannot or will not vote to approve the deal, Council President Donald Tusk said at a press conference at the end of the night, then the UK has only three options to avoid a disorderly Brexit on April 12. EU diplomats were at pains to emphasize that this timeline envisions no further discussions on the EU side. Journalists will not be summoned to Brussels once again on April 11 for an emergency last-minute summit. All EU countries will finalize preparations for no deal and will be ready on April 12. This is it—Brexit is banished from the Council meeting room. It remains unlikely that the UK would actively choose a no-deal Brexit should the deal fail next week, given the UK Parliament has already voted to rule out such an outcome. But it could still happen if they cannot come up with any other solution. And the EU27 have said they will not intervene if they see the UK accidentally stumbling toward the cliff edge. Whether they would actually stick to this threat is open for debate. Never say never to an emergency summit. The UK government could, as Tusk mentioned, choose to avoid the cliff by revoking Article 50 and cancelling Brexit. The European Court of Justice has ruled that this can be done unilaterally and cannot be vetoed the EU27. This would not necessarily mean Brexit doesn’t happen—the UK could choose to trigger Article 50 again at a future date, once the government has a clearer idea of what it wants. The other option is to ask for a long extension. EU leaders have said this would only be possible should circumstances materially change. This would most likely come in the form of a new general election and government change, or a second referendum. In order to get this long-term extension, the UK must commit to holding an election to the European Parliament in the week of May 23—something Theresa May has said she cannot countenance doing as prime minister. The concern is that if the UK is still a member when the new European Parliament takes its seats on July 2, and Britain hasn’t run elections in May, it would mean that this EU Parliament is illegally constituted. This would leave both the European Parliament and the Commission open to legal challenges. However, even if the UK commits to run the European Parliament election and plans a new national election, the EU27 could still reject a long-term extension. French President Emmanuel Macron has said he is opposed to a long-term extension in almost all circumstances. He does not want a situation where the UK continues to be inside the EU and voting while it still intends to leave. However Macron could be convinced to soften his stance if the UK commits to abstain from voting in the EU unless and until it decides to remain. Eager to be rid of the Brexit mess, the EU27 leaders were at pains last night to stress that the ball is now in London’s court. John Bercow, the speaker of the House of Commons, must first decide if he will allow Theresa May to bring back the same deal for a third vote. Should the vote go ahead, Theresa May will have to convince more MPs to approve her deal. Given how much she alienated MPs in her televised address to the public on Wednesday night, this seems unlikely. Indeed, her attacks on the Parliament as thwarting the will of the people so incensed some members of her own Conservative Party that they have said they would vote against her deal on the third try, even though they had supported it on the second try. It is quite possible that Theresa May would respond to a third rejection by calling a general election—or could be forced to do so by a no-confidence vote triggered by opposition leader Jeremy Corbyn. Such an election would obviously take longer than two weeks to organize, and so the UK would say this is enough reason to grant a long-term extension. It is possible, some have theorized, that the general election could happen on the same day as the European Parliament election—maximizing turnout and providing a clearer gage of whether the public wants a second referendum to overturn the first one. The other option, calling a second referendum without a new general election, remains a distinct possibility. The Labour Party officially supports it, even though everyone knows that party leader Corbyn secretly opposes it. Parliament rejected the idea of a second referendum last week in a procedural vote, but that is assumed to have failed because MPs who support the so-called “People’s Vote” thought it was not the right time to ask for one. It does not mean that Parliament has definitively ruled it out. How things play out in the coming week may depend on what kind of turnout a “People’s Vote March” attracts in the UK this weekend. If the turnout is lackluster, MPs may not be convinced that there is the public will for anything but a no-deal Brexit. If the turnout is equal or greater to the last march, they may well be convinced.